Buying an indulgent ingredient to use just a small amount in a single recipe may seem indulgent, but I justified the expense knowing I’d be motivated to start experimenting with other dishes. That’s exactly what happened with a bottle of dry Marsala I’d bought recently, and how I came to make this delicious recipe. After making a mental note to look more closely at a recipe for Pork Braised with Marsala and Red Wine, I totally forgot which of my many cookbooks I’d been browsing. “Eat Your Books” is an amazing resource if like me you have a large book collection and a bad memory. A quick search inside my EYB library located the recipe’s whereabouts but to my frustration I discovered I’d bought the wrong cut of meat. Luckily I’m not easily deterred. I have very few recipes that slow cook pork and perhaps that left my creativity unconstrained because in the end, while my dish only fleetingly resembled the Marcella Hazan recipe that had inspired it, I was extra happy with the result. The meat was sweet and delicate and the sauce had developed a beautiful deep richness. It was so good that we greedily wiped our plates clean with bread. I now beginning to think that dry Marsala as an essential pantry item. Cut the pork into pieces 5cm square, then toss the pork in the flour and shake off the excess. Heat the olive oil in a saute pan and thoroughly brown the meat in batches. Transfer to a cast iron casserole dish and sprinkle over the fennel seeds. Dissolve the tomato paste in the wines. Deglaze the saute pan with the wine mixture being sure to scrape all the caramelised residue into the sauce. Pour the wine over the pork, then add enough stock to cover the meat. lay a piece of baking paper over the surface of the meat, cover the casserole dish then braise the meat in the oven for 1 hour. Chill the braised meat in the sauce overnight to allow the flavours to ripen. Lift the fat from the surface. Heat the meat and once the juices have melted stir in the vincotto. Simmer for 15 minutes to thoroughly heat through. Stir in the parsley, adjust the seasonings. Serve with soft polenta and rocket. This looks delicious, i have pinned it for future cooler weather. Thanks for the reminder and suggestion of EYB, I should try it as I have a huge collection as well. Thanks John, no Bartolini I’m sorry to say, just a lifetime of rubbing shoulders and eating the food of Melbourne’s enormous Italian community. How good would this be with polenta? Looks mouthwatering. Thanks Cheery, It was bloody delicious! Sandra, that looks excellent. The photo inspires me to try even more stews over the coming weeks (as we gently slip out of summer on this side of the world. Ooo thanks for the tip Beck…. Great recipe, lovely ingredients. I love dry Marsala in a sauce, it makes the best onion gravy! Thanks Linda, thanks for that tip…. A very interesting pork recipe which is ‘down’ to try after the Olympics! In addition to the Marsala methinks the inclusion of fennel seeds and vinocotto should play quite a part: I ‘treat’ myself with various Maggie Beer ones every few months 🙂 ! Oh, that sounds/looks delicious! I think I did a free trial of Eat Your Books when it first started, but I’d forgotten about it. I think it is a wonderful idea, as I have the same problem with the overflowing cookbooks and lack of memory! Marsala is one of my pantry essentials- it keeps and it gets used in may dishes. 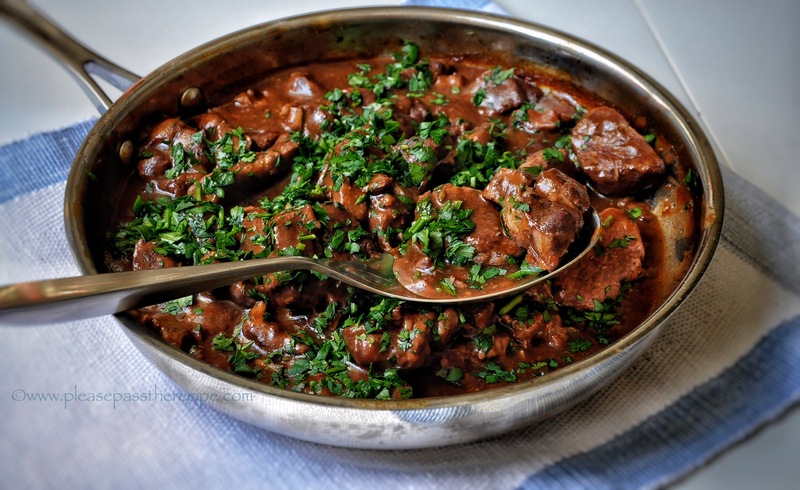 Though not a pork fan, this recipe does look delicious with marsala and vincotto. This bottle is my first encounter with dry Marsala, I’m loving it…. This recipe has inspired me to start a ‘recipe’ category on my non-cooking blog, just so I can remember to try it – it sounds delicious, thanks Sandra! Oh my! I have bookmarked this. Definitely one to try. Yes, dry marsala is an essential pantry ingredient, though I never seem to have it on hand when I want it. Absolutely love this with the polenta. I will see how this goes down with a Greek audience. Very well, I would think. This entry was posted on August 11, 2016 by ladyredspecs in FODMAP diet, Food, Gluten Free, Lactose Free, Main Meals, Pork and veal and tagged braise, Fodmap, Italian, Marsala, pork, red wine, vincotto, wine.